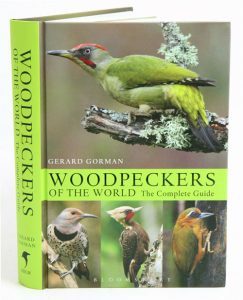 Woodpeckers remain one of the most popular families of birds, and they are certainly one of the more unusual. Their legendary ability to excavate holes in wood is well known, and they are uniquely adapted for living in trees – though a few species have become more adapted to ground-dwelling. The family ranges from the tiny piculets of tropical forests to the mighty Imperial Woodpecker of Mexico, sadly now extinct. In between there is a considerable variety of species, all of a roughly similar shape and design, inhabiting forests and woodlands through the world except Australasia and Antarctica. Artist/Author: Poonswad, Pilai, Alan Kemp and Morten Strange. The first photographic monograph to the order of Bucerotiformes. Photographs illustrate all 57 species in tropical Africa and in Asia, male as well as female, and all distinct subspecies. Detailed descriptions of each species provides information distribution, ecology and habitats, breeding and status. There are additional chapters covering evolution, habits, social life, feeding and breeding ecology as well as conservation. Imperial dreams: tracking the Imperial woodpecker through the wild Sierra Madre. Naturalist Tim Gallagher journeys deep into the savagely beautiful Sierra Madre, home to rich wildlife and other natural treasures, and also to Mexican drug cartels, in a dangerous quest to locate the rarest bird in the world–the possibly extinct Imperial Woodpecker, the largest of all “carpinteros.” Explorer and noted bird expert Tim Gallagher is no stranger to the obsession for adventure. In the early 2000s, Gallagher rediscovered the legendary Ivory-billed woodpecker, which most scientists believed had been extinct for sixty years, causing an international stir. Now, in this book, Gallagher once again hits the trail, with a “natural treasure” map of sightings of the Imperial bestowed on him by a friend on his deathbed. 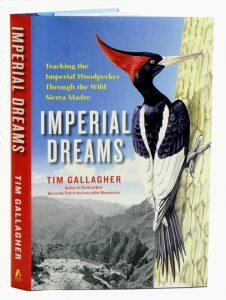 Charged with continuing the quest of a line of distinguished naturalists, including the great Aldo Leopold, to find and protect the Imperial woodpecker in its last habitat, Gallagher ventures deep into isolated territory, the high pine forests of Mexico’s Sierra Madre Occidental. In this mysterious, historically wild area, Geronimo led Apaches in their last stand and William Randolph Hearst inherited a storied ranch, which Pancho Villa looted. Today, drug lords rule the land. Here in the Sierra, the giant Imperial’s pounding drumbeat once echoed like the blows of an ax through the Sierra as it bored into the massive, grub-infested pines, hammering on them powerfully for weeks at a time until they groaned, shuddered, and finally toppled with a thunderous impact that shook the ground. The bird had largely disappeared by the early 1950s, yet rumors of Imperial Woodpeckers flying through remote forests persist. Gallagher’s quest takes a terrifying turn as he encounters armed drug traffickers, burning houses, and fleeing villagers. His passionate mission, now a life-and-death drama, will keep armchair adventurers on the edge of their seats as he chases truth in the most dangerous of habitats. Artist/Author: Erritzoe, Johannes, Clive F. Mann, Frederik P. Brammer, and Richard A. Fuller. 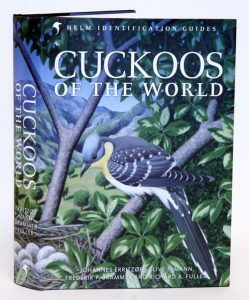 This authoritative handbook, part of the Helm Identification Guides series, looks in detail at the world’s cuckoos, couas and anis – the family Cuculidae. Famed as brood-parasites of other birds, the cuckoos include a diverse range of species, from the roadrunners of North America to the spectacular malkohas of southern Asia. This book discusses the biology and identification of these birds on a species-by-species basis, bringing together the very latest research with accurate range maps, more than 600 stunning colour photographs that illuminate age and racial plumage differences, and 36 superb plates by a team of internationally renowned artists. This is a definitive natural history of the spectacularly beautiful tropical birds known as the Trogons, a family that includes the legendary Resplendent quetzal, the sacred bird of the ancient Mayans and Aztecs. A collaboration between renowned ornithologist Joseph Forshaw and eminent bird artist Albert Gilbert, Trogons combines science and art to create an unprecedented picture of a threatened bird family. 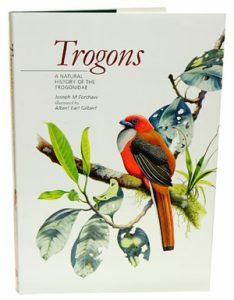 Forshaw’s text provides the most authoritative and comprehensive account of the trogons ever written, and Gilbert’s stunning paintings are the first to accurately depict all species of trogons in their natural habitats and true colours. The print run is small. Print on demand title. Part of the Bird families of the world series. The author presents a new evolutionary history of the cuckoo family based on molecular genetics. There is much original material including previously unpublished field observations and song comparisons identifying new species. 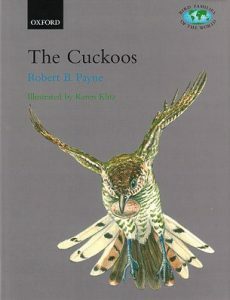 The book is divided into two parts: part one has eleven chapters devoted to cuckoo biology, part two covers all cuckoo species and their life histories. 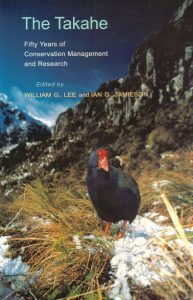 The Takahe: fifty years of conservation management and research. Artist/Author: Lee, William G. and Ian G. Jamieson, editors. For more than fifty years attempts to conserve the Takahe (Porphyrio hochstetteri), a large, flightless, herbivorous bird, have pioneered techniques for managing protected natural areas, habitat manipulation, captive rearing, wild releases, and island translocations. This title is not held in stock but we are happy to supply on special order. Please contact us. Completed in sixteen volumes. Volume 6 covers the Order Coliformes – Family Coliidae (Mousebirds); Order Trogoniformes – Family Trogonidae (Trogons); and Order Coraciiformes families Alcedinidae (Kingfishers), Todidae (Todies), Momotidae (Motmots). Meropidae (Bee-eaters), Coraciidae (Rollers), Brachypteraciidae (Ground-rollers), Leptosomidae (Cuckoo-rollers), Upupidae (Hoopoes), Phoeniculidae (Wood-hoopoes), and Bucerotidae (Hornbills). It contains a foreword on avian bioacoustics. 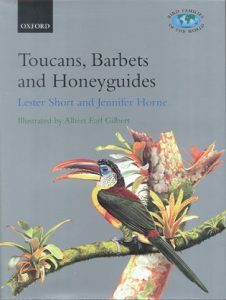 Toucans, barbets, and honeyguides: Ramphastidae, Capitonidae and Indicatoridae. Artist/Author: Short, Lester L. and Jennifer F. M. Horne. This title is not held in stock but we are happy to supply on special order. Please contact us. 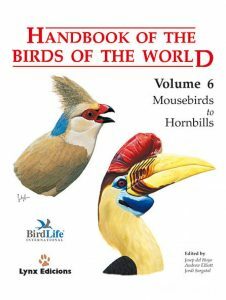 A volume from the Bird families of the world series. 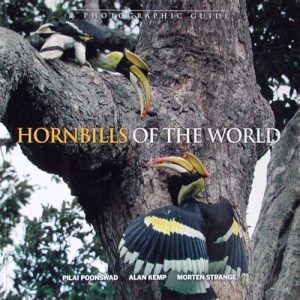 Covers the life, history, relationships, biology, and conservation of 34 species of toucans, 84 barbets and 17 honeyguides. The book is divided into two sections: the first is a biological overview of the groups covering the key aspects of their behaviours and ecology. The second section is devoted to individual species accounts and gives plumage descriptions, field characters including voice, distribution, habits and life cycle. Artist/Author: Chantler, Phil and Gerald Driessens. 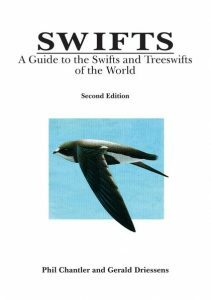 The comprehensive text has a strong emphasis on identification and distribution, but also includes information on habitat, voice, habits and breeding. The species’ descriptions are very detailed, range maps included for each species.